Heisenberg is the inspiration behind "Heisenberg", the alter ego of Walter White, the main protagonist of Breaking Bad. These two successes, and the continuing failure of the Bohr–Sommerfeld model to explain the outstanding problem of the anomalous Zeeman effect, led Heisenberg to use the virtual oscillator model to try to calculate spectral frequencies. The method proved too difficult to immediately apply to realistic problems, so Heisenberg turned to a simpler example, the anharmonic oscillator. In his late-sixties Heisenberg penned his autobiography for the mass market. In 1969 the book was published in Germany, in early 1971 it was published in English and in the years thereafter in a string of other languages. Heisenberg had initiated the project in 1966, when his public lectures increasingly turned to the subjects of philosophy and religion. Heisenberg had sent the publishers Hirzel and Wiley the manuscript for a textbook on the unified field theory. This manuscript, he wrote to one of his publishers, was the preparatory work for his autobiography. He structured his autobiography in themes, covering: 1) The goal of exact science, 2) The problematic of language in atomic physics, 3) Abstraction in mathematics and science, 4) The divisibility of matter or Kant's antinomy, 5) The basic symmetry and its substantiation, and 6) Science and religion. Heisenberg wrote his memoirs as a chain of conversations, covering the course of his life. The book became a popular success, but was regarded as troublesome by historians of science. In the preface Heisenberg wrote that he had abridged historical events, to make them more concise. At the time of publication it was reviewed by Paul Forman in the journal Science with the comment "Now here is a memoir in the form of rationally reconstructed dialogue. And the dialogue as Galileo well knew, is itself a most insidious literary device: lively, entertaining, and especially suited for insinuating opinions while yet evading responsibility for them." Few scientific memoirs had been published, but Konrad Lorenz and Adolf Portmann had penned popular books that conveyed scholarship to a wide audience. Heisenberg worked on his autobiography with the publisher Piper in Munich and initially proposed the title Gespräche im Umkreis der Atomphysik (Conversations around atomic physics). He settled with his publisher on Der Teil und das Ganze (The part and the whole). An English translation under the title Physics and Beyond: Encounters and Conversations was published in 1971. Cassidy, David C. (2001). Werner Heisenberg : A Bibliography of His Writings (2nd ed.). Whittier. ISBN 978-1-57604-115-4. Ludovico, Anna (2001). Effetto Heisenberg. La rivoluzione scientifica che ha cambiato la storia. Roma: Armando. p. 224. ISBN 978-88-8358-182-3. Blum, Barbara; Heisenberg, Helmut; Ludovico, Anna (2006). Per Heisenberg. Roma: Aracne. p. 96. ISBN 978-88-548-0636-8. Sommerfeld, A.; Heisenberg, W. (1922). "Eine Bemerkung über relativistische Röntgendubletts und Linienschärfe". Z. Phys. 10 (1): 393–398. Bibcode:1922ZPhy...10..393S. doi:10.1007/BF01332582. Sommerfeld, A.; Heisenberg, W. (1922). "Die Intensität der Mehrfachlinien und ihrer Zeeman-Komponenten". Z. Phys. 11 (1): 131–154. Bibcode:1922ZPhy...11..131S. doi:10.1007/BF01328408. Born, M.; Heisenberg, W. (1923). "Über Phasenbeziehungen bei den Bohrschen Modellen von Atomen und Molekeln". Z. Phys. 14 (1): 44–55. Bibcode:1923ZPhy...14...44B. doi:10.1007/BF01340032. Born, M.; Heisenberg, W. (1924). "Über den Einfluss der Deformierbarkeit der Ionen auf optische und chemische Konstanten. I". Z. Phys. 23 (1): 388–410. Bibcode:1924ZPhy...23..388B. doi:10.1007/BF01327603. — (1924). "Über eine Abänderung der formalin Regeln der Quantentheorie beim Problem der anomalen Zeeman-Effekte". Z. Phys. 26 (1): 291–307. Bibcode:1924ZPhy...26..291H. doi:10.1007/BF01327336. — (1925). "Über quantentheoretische Umdeutung kinematischer und mechanischer Beziehungen". Zeitschrift für Physik. 33 (1): 879–893. Bibcode:1925ZPhy...33..879H. doi:10.1007/BF01328377. The paper was received on 29 July 1925. [English translation in: van der Waerden 1968, 12 "Quantum-Theoretical Re-interpretation of Kinematic and Mechanical Relations"] This is the first paper in the famous trilogy which launched the matrix mechanics formulation of quantum mechanics. Born, M.; Jordan, P. (1925). "Zur Quantenmechanik". Zeitschrift für Physik. 34 (1): 858–888. Bibcode:1925ZPhy...34..858B. doi:10.1007/BF01328531. The paper was received on 27 September 1925. [English translation in: van der Waerden 1968, "On Quantum Mechanics"] This is the second paper in the famous trilogy which launched the matrix mechanics formulation of quantum mechanics. — (1932). "Über den Bau der Atomkerne. I". Z. Phys. 77 (1–2): 1–11. Bibcode:1932ZPhy...77....1H. doi:10.1007/BF01342433. — (1944). "Die beobachtbaren Grössen in der Theorie der Elementarteilchen. III". Z. Phys. 123 (1–2): 93–112. Bibcode:1943ZPhy..123...93H. doi:10.1007/BF01375146. — (1948). "Das elektrodynamische Verhalten der Supraleiter". Z. Naturforsch. 3a (2): 65–75. Bibcode:1948ZNatA...3...65H. doi:10.1515/zna-1948-0201. — (1948). "Bemerkungen um Turbulenzproblem". Z. Naturforsch. 3a: 434–7. Bibcode:1948ZNatA...3..434H. doi:10.1515/zna-1948-8-1103 (inactive 2019-02-19). — (1952). "Mesonenerzeugung als Stosswellenproblem". Z. Phys. 133 (1–2): 65–79. Bibcode:1952ZPhy..133...65H. doi:10.1007/BF01948683. — (1949) . The Physical Principles of the Quantum Theory. Translators Eckart, Carl; Hoyt, F.C. Dover. ISBN 978-0-486-60113-7. ^ a b c Mott, Nevill; Peierls, Rudolf (1977). 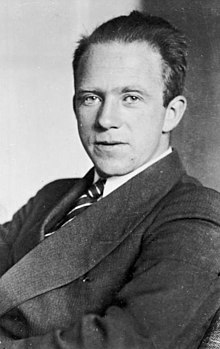 "Werner Heisenberg 5 December 1901 – 1 February 1976". Biographical Memoirs of Fellows of the Royal Society. 23: 212. doi:10.1098/rsbm.1977.0009. ^ Conradt, Stacy (1 October 2013). "Beyond Breaking Bad: Meet the real Heisenberg". The Week. Retrieved 21 March 2019. ^ Kursunoglu, Behram N.; Wigner, Eugene P. (April 26, 1990). Paul Adrien Maurice Dirac: Reminiscences about a Great Physicist. Cambridge University Press. p. 132. ISBN 978-0-521-38688-3. ^ Segrè, Emilio G. (1980). From X-rays to Quarks: Modern Physicists and Their Discoveries. W.H. Freeman. ISBN 978-0-7167-1146-9. ^ Pais, Abraham (1991). Niels Bohr's Times in Physics, Philosophy, and Polity. Clarendon Press. pp. 275–279. ISBN 978-0-19-852049-8. ^ Goudsmit, Samuel A. (1947). Alsos. New York: Henry Schuman. pp. 77–84. ISBN 978-0-938228-09-7. OCLC 8805725. ^ Groves, Leslie (1962). Now it Can be Told: The Story of the Manhattan Project. New York: Harper & Row. p. 231. ISBN 978-0-306-70738-4. OCLC 537684. Bernstein, Jeremy (2001). Hitler's Uranium Club: The Secret Recording's at Farm Hall. Copernicus. ISBN 978-0-387-95089-1. Beyerchen, Alan D. (1977). Scientists Under Hitler: Politics and the Physics Community in the Third Reich. Yale. ISBN 978-0-300-01830-1. Greenspan, Nancy Thorndike (2005). The End of the Certain World: The Life and Science of Max Born. Basic Books. ISBN 978-0-7382-0693-6. Also published in Germany: Max Born – Baumeister der Quantenwelt. Eine Biographie. Spektrum Akademischer Verlag. 2005. ISBN 978-3-8274-1640-7. Mehra, Jagdish; Rechenberg, Helmut (2001). Volume 1 Part 2 The Quantum Theory of Planck, Einstein, Bohr and Sommerfeld 1900–1925: Its Foundation and the Rise of Its Difficulties. The Historical Development of Quantum Theory. Springer. ISBN 978-0-387-95175-1. Mehra, Jagdish; Rechenberg, Helmut (2001). Volume 3. The Formulation of Matrix Mechanics and Its Modifications 1925–1926. The Historical Development of Quantum Theory. Springer. ISBN 978-0-387-95177-5.
van der Waerden, B.L., ed. (1968). Sources of Quantum Mechanics. Dover. ISBN 978-0-486-61881-4. Walker, Mark (1993). German National Socialism and the Quest for Nuclear Power 1939–1949. Cambridge. ISBN 978-0-521-43804-9.